The Sapphire & Nature Coasts, NSW group at RedBubble completed its Landscapes of the Sapphire & Nature Coasts photography challenge on Tuesday 26 January, 2010 - Australia Day. Six entries were submitted by group members for voting, and I'm pleased that my Cocora Beach - Eden travel photograph received five votes and was the eventual winner of the competition. It's beaut that my peers have taken time out to judge the photograph and vote for it. Thanks to those who voted and participated in the competition. The Sapphire & Nature Coasts, NSW group displays fantastic imagery of a popular holiday region in Australia. As someone who travels to the area each year for professional travel photography and writing interests, I enjoy viewing the photography works submitted to the group by members. It's an area I appreciate very much. 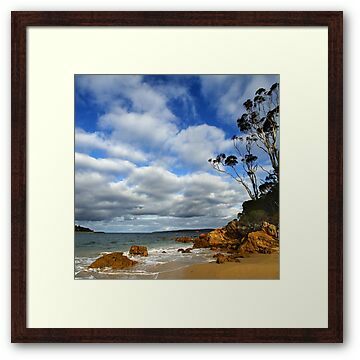 My travel photography images of the beautiful Sapphire Coast and Eurobodalla Coast regions are displayed in my online gallery where they are available for sale as framed prints, matted prints, mounted prints, canvas prints, laminated prints, cards and posters.